The MechanoBiology Laboratory (MBL) is dedicated to pursuing research in fibroblast/stem cell mechanobiology, functional tissue engineering of tendon/ligament healing, and biological applications of micro-fabrication and micropatterning technologies. One research focus in the MBL is the study of the cellular and molecular mechanisms of tendinopathy, a prevalent tendon disorder that affects millions of people in both occupational and athletic settings. 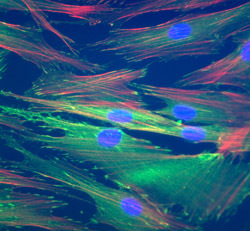 Another research focus is the investigation of the role of tendon stem cells (TSCs) in the development of tendinopathy. Still another is the repair of tendinopathic tendons using TSCs, platelet-rich plasma (PRP), and engineered tendon matrix (ETM). We apply interdisciplinary approaches to our investigations. New technologies such as cell traction force microscopy (CTFM) and micropost force sensor array are currently used in cell mechanobiology studies. The research in the MBL is funded by the National Institutes of Health and other funding sources.